Love carrot cake? Then this carrot cake is for you! 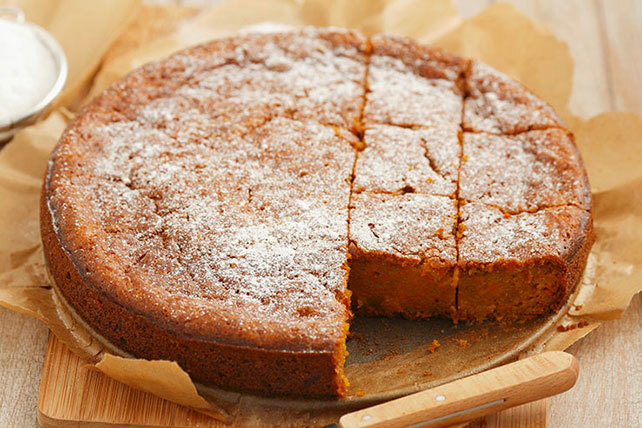 Moist and lightly spiced, this carrot cake will garner rave reviews. Grease and flour a 10-inch springform pan. Beat eggs, sugar, oil and vanilla in large mixing bowl with electric mixer. In separate bowl, mix flour, baking powder, baking soda and spices. Add raisins and toss to coat. Add dry flour mixture to egg mixture. Stir in grated carrots and mix well. Fold in walnuts. Pour batter into prepared pan. Bake 60 to 70 min. or until toothpick inserted in centre comes out clean. Cool in pan 10 to 15 min. Remove cake from pan, let cool completely. Dust cake with 2 Tbsp. icing sugar.